Yes, flooding. But this time deliberate. Along the banks of the Roding a new flood wall has been built set way back from the river. The old wall has been removed so that this area can flood creating a lagoon, for wildlife, fish and plants. 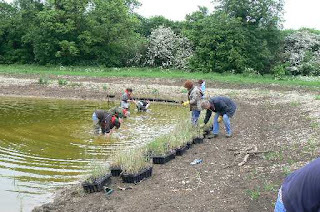 Pictured are some volunteers doing some reed planting earlier this year. It’s location is on the east bank just a little north of Ray Park. Go see, it’s a gem. August/September 2008: at a public meeting/inquiry in Woodford the vexed question of Flooding cropped up once again. Regrettably one building (yes building) that was affected is the newly-built block next to the Great Conversation’s Sell-Off Land at Derby Road, Salway Hill. This flooding being present due to inadequate developer investigation into the substrate has meant that Tesco (a multi-billion-pound [£] company) are not now going to move in to this new building within a frog-spitting distance of Waitrose, Sainsbury and the Ex Queen Mary’s College complex. A bit further north than these admittedly. Call me cynical, but anyone with long local knowledge knows that the River Hart (a brook really) runs along the Woodford Road above Salway Hill and originally found its way; above ground, downhill from there to join up with the Fille Brooke which now runs in Hollybush Hill, just to the east side of the now, Snaresbrook Crown Court. Yes that concrete ditch. The Hart was piped many years ago from Johnson Pond, down Salway Hill under the stretch between the now Woodford Library in a straight line under the grass verge at The Drive Snaresbrook, under Hermitage Walk and then into an open ditch the other side of Hermitage Walk to Snaresbrook Road, under this road and met up with the Fille Brook where both minor rivers join and go underground in a concrete pipe along Hollybush Hill, Leyton Way and along Fillebrook/e Road in Leytonstone to finally join up with the River Lee (Lea). All of which is documented in archives, not difficult to find to the trained researcher. But not so accessible to our modern get-rich-quickly-please developers, it seems. Due to the clay and gravel substrate of Redbridge, there are many such problems with ground water, because the water table in Redbridge relies not on the flat openness of a field, but the undulating valleys of the Roding and Lee, which brought a glacier forward so many years, centuries previously. Such action by these glaciers created a stone and clay environment which inevitably formed hollows and pockets of trapped water, this is shown by the bounteous volumes of clay which were used at Broadmead Road by French’s for brick making, by the Lord and Earls who first constructed the lakes at Wanstead House. Meanwhile the gravel afforded the smugglers refuge to tunnel from the old Green Man public house in Leytonstone into the, then more dense forested area. Another irony is the naturally filled Hollow Ponds at Whipps Cross which owe their water content to the clay underlying the gravel which used to be their content. We now see few rivers and brooks at the surface, but there are many to be seen, mostly in wintertime; appearing in their ground state in many parts of the forest, on Leyton and Wanstead Flats, another being less evident now than in previous years, runs towards Walthamstow and yet another near Forest School wends its way towards the Lee. This historical knowledge clearly shows that Redbridge is actually a wetland area riddled with under-ground or latently submerged water channels. Those that have been encased in concrete, have long since changed their course, due mainly to the concrete obstructions, this is why it is only at high water-table do these rivers and brooks run freely once more, popping up along their old or new routes in back gardens, front gardens or elsewhere. The Roding, for example is put into concrete (known as canalized) yet in high water-table situations the original meandering Roding springs forth, along with its tributaries, well outside these concrete structures. One most amazing diversion that concrete has initiated is the Roding between Wanstead and Redbridge Underground stations, which now take sits course is strange places when ground-water is high, where it can be found to follow the M11/A12M Link Road on both sides finally emerging at a number of places along the route it now follows; somewhat restrictedly, in the direction and catchment of the River Lee. So, should this part of the Roding be renamed Rolee River, perhaps? Of course the bulk of the water that finds its way into the Roding as it lies today, actually comes from well up-river, with very little Local, Redbridge ground-water being able to enter the Roding’s concrete sides because Redbridge has deemed to use that all persuading barrier, known as concrete. Certainly from Snakes Lane East down to the Barking Creek, only the rain that falls on the River in Redbridge is retained by the banks of the Roding, but no Redbridge ground-water enters the Roding’s flow along this stretch. So the outcry at the Public Meeting/Inquiry in late summer 2008 regarding ground-water, should have been taken on board long before the Planners and Developers became greedy for expansion. An expansion that they are now realizing is at a cost greater than they even thought possible. With Land-Sales in Redbridge set to increase, even in the obvious Fairlop Waters – that name contain the word ‘Waters’ – yet is still propositioned to be built upon. The Flood Plain of any River is merely ‘indicative’ of extreme flood conditions which are areas of freely-flowing water, and not of the density and quantity of the ground water-table, trapped water-pockets nor indicative of the many subterranean streams, brooks and springs. Here are the Wetlands of the London Borough of Redbridge G.L.A., enhanced by the Wetlands of Fairlop and The Roding (opposite Ray Park). I have read the wonderfully complex description of the underground water system in Redbridge written By Dr Richard Cooper. I remember reading a blog from B21 talking about Foul Well (Fullwell). Recently, a fellow plot holder mentioned at Cabinet an underground source at the site of the Glade allotment. Also, I was talking to a long-time resident of the borough (his mother was born in a cottage near the Fullwell Cross roundabout. He is in his late seventies and he remembers the allotments being flooded all the way to the roundabout and him catching newts in a home-made net. There are also whispers of an underground stream , in the allotments, along the Tomswood Hill border. A really interesting piece. In Seven Kings where I live there are thought to be numerous underground water courses. I think in earlier times when Ilford and surrounding areas expanded rapidly due to urbanisation concern about future problems were most likely not a top priority. Therefore I bet there are likely to be more surprises as it seems the general water table level is rising.